Now it’s very important to emphasize what I am saying. I am not saying – and I repeat, I am not saying – that Wall will never be a great basketball player. What I am saying is that in college and summer league he was not a great basketball player (again, I am differentiating what Wall has done from what he might do in the future). We have now moved further into the future (relative to where we were last summer). So what does Wall look like 64 games into his rookie season? To answer this question, let’s refer to a model that Slate.com recently told us that “many NBA stats experts use as part of their player evaluation system.” No, I am not talking about Wins Produced. Nor am I talking about Player Efficiency Rating (although Slate.com told us that teams use this method as well). What I am talking about is Adjusted Plus-Minus (APM). According to APM numbers reported at Basketball-Value.com, John Wall hasn’t just had a difficult rookie season. John Wall – again, according to APM – is actually the least productive player employed by the Wizards. Yes, you read that correctly. Wall is the least productive player on a team that has only won 16 games this year. And let me add that when you look at the Cleveland Cavaliers and Sacramento Kings – the only two teams that are actually worse than the Wizards this season – there is not a single player on either team offering less than Wall. When you look at the entire league, you see eight players in the NBA who have a lower APM than Wall. Apparently – according to APM – Wall has been an incredibly poor choice. Now some people might object to this analysis. Certainly when I suggested that Wall may not be a great player, there was quite an uproar. And all I did was suggest a possibility. I never said Wall was definitely not going to be a great NBA player. The APM model, though, is clearly telling us that so far, Wall has definitely not been a very good NBA player. In fact – according to APM – Wall is one of the worst players in the NBA. So where is the uproar? And where is the uproar when APM argues that Kobe Bryant is well below average? Or Ray Allen, Kevin Martin, or Al Jefferson? Yes, these players are also well below average this season according to APM. But as far as I can tell (and maybe I am just not looking in the right places), I don’t see too many people upset with the idea that a model NBA teams are paying money to employ arguing that John Wall and Kobe Bryant are two of the worst players in the league (and this seems odd since I have occasionally heard quite an uproar over what Wins Produced says about Allen Iverson, Carmelo Anthony, Derrick Rose, Ben Wallace, Dennis Rodman, etc… ). The estimated APM coefficients are often not statistically significant. So for most players, the correct interpretation of the results is that the player in question does not have a statistically significant impact on outcomes. In other words, it isn’t the case that Kobe Bryant is really a poor player this year. What we can actually say about Kobe from the APM results is that Kobe’s impact is not statistically significant. And this is the same story for most players. APM people will note that if you add more years, standard errors will fall. But we need to remember that the size of a data set and the standard errors are inversely related. In other words, for any regression, more data will lead to lower standard errors. One would also note that for APM estimates across five years, it is still the case that many players are not found to have a statistically significant impact on outcomes. APM results are very inconsistent over time. So a decision-maker cannot look at past values and use these for decisions about the future (of course, all decisions are about the future). This is especially true for players who switch teams. And that means, APM results for players on different teams isn’t telling you much about what that player will do for your team. The model itself doesn’t really appear to explain outcomes. As Arturo Galletti noted, the initial model (i.e. the model where – in the words of someone selling this model to an NBA team – “the effects of the other players on the floor are accounted for”) explains less than 5% of outcomes. This point was never noted by the APM people in the past (at least, it isn’t mentioned HERE). Mosi Platt – of the Miami Heat Index – discussed the APM issue a few days ago and wondered by the statisticians the NBA has hired weren’t able to note the problems with this model. My sense is that when an APM person is hired by an NBA team, that person becomes the “stats department” for that team. In other words, there isn’t an independent group evaluating models for the NBA. the model where we attempt to control for teammates explains less than 5% of outcomes. most of the results from the model are statistically insignificant, and that means APM cannot tell you if most players had any statistically significant impact on outcomes. If the NBA teams who purchased this model were told all this, and then still decided to pay money for the model, then that might be fine. But if this information was withheld from the buyers of the model, then there might be some problems. We do know that APM people have been quite critical of box score methods in the past. And some (but not all), have been very critical of Wins Produced. But as is often noted, a team’s offensive efficiency and defensive efficiency (from these we derive ADJ P48 and Wins Produced) explain outcomes in the NBA (the same cannot be said for PER – a model, once again, that Slate.com says NBA teams also use). And unlike APM, ADJ P48 is quite consistent across time. In other words, it is possible to use the box score numbers and create a model that both explains outcomes and is consistent over time. And that means the APM model appears to be a solution in search of a problem. Or to put it simply, not only is the APM model not very helpful, it isn’t clear the APM model is really necessary. Okay, if APM isn’t necessary, how are we going to evaluate John Wall? Well, how about we just look at Wins Produced. As noted, the Wizards have only won 16 games. If we look at last year’s performances, we would have expected the Wizards to have only won about 10 games. So as bad as the Wizards have been, they are a little bit better than last year’s numbers suggest. And this is primarily because Nick Young has progressed from “awful” to “just bad” while Javale McGee has progressed from “below average” to “above average”. McGee is progressed so far that he is now the most productive player on the Wizards. Unfortunately that isn’t saying much. McGee’s WP48 [Wins Produced per 48 minutes] is only 0.154. And if that is your best player (a point similar to something I made about five years ago), then your team is not likely to be very good. contrary to the APM story, it appears John Wall has been slightly above average (you could also say “about average”). in terms of WP48, Booker has done more than Wall. So Wall isn’t even the most productive rookie on the Wizards. So let the outrage begin!! Wins Produced says Wall isn’t the most productive rookie on the Wizards. Once again… that doesn’t mean that Wall will never be any good. It just means that so far he has been about average. If that makes you unhappy… well, at least I am not saying Wall is one of the worst players in the game. I just hope this explains why the Bulls don’t have a stats department. Since Gar Forman has taken over the GM position, the Bulls have made quite a few moves Wins Produced would justify. They may have slightly overpaid Kyle Korver, but they signed Boozer and resigned Noah (both at priced Wins Produced says are bargains) and turned down Anthony and showed no interest in a number of other players Wins Produced says are overrated. I’m really quite pleased. Although Wall may be average this season, I think he is a near sure bet to become a very productive player. The areas of his game that hurt his productivity the most, poor shooting and turnovers, are areas that rookies typically struggle in. If Wall progresses like Derrick Rose – by improving his shooting and lowering his turnovers – he could easily surpass Rose’s level of production. Despite this being the fortieth or fiftieth iteration of this post, you show no interest in using APM in a way that people actually use it and insist on attacking the same straw-men. APM can do nothing to untangle co-linear player pairs, which pop up a lot if you use one-year APM. That’s why most people use more than one year and place less confidence in ratings where extreme co-linearity is found. Fortunately for us fans and hobbyists, APM at basketballvalue.com provides standard errors with every APM rating. You might wonder why the standard error for Kobe’s 2010-2011 sample is so high relative to his minutes logged in the sample. It’s thanks to co-linearity with Pau Gasol; 90% of Kobe’s minutes were played alongside Gasol and APM doesn’t have enough minutes logged in enough distinct combinations to tell who is responsible for what in that pair. You find the same thing with Derrick Rose and Luol Deng, with Durant and Westbrook. Someone who uses APM to evaluate players for a living would know to use more years or temper any conclusions they draw from it. I’m sure their understanding of the model is several levels higher than the fan or hobbyist (who still knows to read SE and pick the best-sized sample for the evaluation at hand). Furthermore, the front-page post about APM last week (which was a link to a recent ‘deconstruction’ by Arturo) was more than a little disingenuous – Arturo incorrectly recreated the BValue.com APM, became convinced something fishy was involved with APM, and ended up with the entirely wrong conclusion about how the popular versions of APM are computed. Perhaps these posts would go differently if you went into the math with a good-faith effort to re-create APM and use it like people actually use it. I’ll try to refine my technique and find nicer ways to say these things, but if you keep beating your dead horse I’ll keep beating mine. 1. Basketballvalue.com reports one-year APM measures. And I don’t see a disclaimer prominently offered. I also see no discussion for any APM measure (whether it be one-year, two-year, or five-year) of statistical significance. The problem with statistical significance applies even when we look at the five-year results. 2. People report one-year results all the time. Certainly the media does this. As does Wayne Winston. And Winston does do this for a living (he is not a hobbyist). Are you sure that when these people consult for teams that they are not doing the same? And how do you know this? 3. There is a real question here. Did the NBA team that hire these people hear of all the problems with the one-year results? And did they hear about the other problems? 4. If you add more data, standard errors fall. That is simply part of how standard errors work. So you can claim more data make this better, but you don’t know that. 5. I believe people have claimed that they don’t follow all of the Rosenbaum steps. But I have not seen anyone deny that the first equation – which is supposed to control for the impacts of teammates – isn’t used. And that first equation has real problems. 6. It should bother you that Rosenbaum failed to report the explanatory power of the first equation. That is rather important information. And it was never reported. In the end, this is a model that was presented to the APBRmetrics community. It was also used extensively to critique Wins Produced. But the problems with this model, that Arturo and I have noted, cast serious doubt on the validity of this approach. And we will keep noting this, even if there is no hope that someone like you (an anonymous person on the Internet) will ever understand this issue. 1. BValue.com provides the data without much in the way of commentary. I’m not sure why you want a disclaimer, though. It’s a pretty specialized service, non-nerds will naturally stay away. Anyone visiting that site should be familiar with standard errors and significance. Again: When you add more years, you’re also making your sample more diverse: More player pairs, Fewer pairs of players that only play when the other is on the court. This is another way of saying that a more diverse sample reduces the error from co-linearity. The standard error on Nowitski’s rating is smaller than Wade’s, despite Dirk logging 350 fewer minutes, because the Mavericks employ more diverse lineups in the sample thanks to injuries and different substitution patterns. 3. I’m not sure why the null hypothesis is that NBA stats consultants are all incompetent charlatans. You can make the case that Wayne Winston writes like he doesn’t understand statistical significance, and I’ll read every word, nodding, but you’ll notice he’s not employed by a team right now. 5. We have two versions of how APM is constructed – the rather straightforward version that was laid in the 82games.com Rosenbaum posts and explained more fully by Eli W.’s Count the Basket blog. You can build it from scratch yourself, if you’d like to satisfy your curiosity about what’s missing and what Rosenbaum et al are ‘hiding’. In the meantime, please stop offering the version of APM’s construction that is mysterious, unknowable, and ominously vague about the steps. That version doesn’t exist. If you’d like to explain exactly which step is suspect, please do so – but don’t link to the Arturo post and tell me that’s what he did. He deconstructed the wrong model. The only doubt you crew have cast is on whether or not you can make a good-faith effort to understand APM and criticize it on the level. PS, my name is Jacob Grey Berger, and you can reach me pretty much anywhere on the internet that advanced basketball stats content exists. In some ways I’m more public and reachable than you. You’re just an anonymous internet person to me too, until I shake your hand someday. Bvalue.com results are quoted be people in the media. As is the work of Wayne Winston (who I believe is working for some other team besides the Mavericks these days). So you are incorrect about the need for a disclaimer. Again, many of these results are not statistically significant. And that is true for the 5-year numbers. Furthermore, what I said about standard errors is also true. More data will lower standard errors. You have also failed to note the problems with the equation controlling for other players. The inability of this equation to explain outcomes is a real problem. Do you know that people take a different approach from this first equation? If so, what is the approach? And if Basketballvalue.com is not using this first equation, and not doing all the steps that followed, then why describe their approach as “Rosenbaum inspired”? Again, there are real problems with this approach. If you were serious about investigating advanced stats, you would be asking these questions. Let me put it to you this way. You seem very anxious to attack the work I present. Why are you less anxious to criticize the APM approach? How about this for a model? I wish to predict whether an on-line person like you will endorse a statistical approach. I think I can predict your preferences by noting who does the work. If the person is an APBR person, Jacob Grey Berger will think it is great. If the work comes from someone outside of the APBR community, Jacob will think it is wrong. Notice, my simply model doesn’t have any information on the quality of the statistical approach. But I bet it does a great job of predicting your reactions. Am I wrong? Mr. Berger, I feel like refusing to address these points renders your arguments superfluous. It seems to me that the idea that one model is useful to decision-makers and one isn’t ought to be the main point of contention. “If the person is an APBR person, Jacob Grey Berger will think it is great. If the work comes from someone outside of the APBR community, Jacob will think it is wrong. Geez, what an eye-roller. I was under the assumption that you could go more than one reply without descending into snark and bizarre one-liners like “on-line person”. I learned that I was wrong, but at least there’s some dark humor to be found in this exchange, I guess. Good day sir. I was not trying to be snarky. I was merely making an observation about the nature of your comments. If this wasn’t true, it seems like an easy point to refute. But I have read a number of your comments and my point seems quite true. And I would echo what Matt says above. You have failed repeatedly to address the central points being made. I’m going to follow the second thread of this post (the John Wall one). For me, there is good news and bad news involved in Wall’s performance. The good news is he is already, as a rookie, producing above average. His assists are much higher than I thought. The bad news is I think he is getting frustrated. And I think this frustration (mostly directed at his largely awful team) is resulting in him shooting a LOT more since the All Star break, which is lowering his productivity. The really awful news is a frustrated John Wall constantly put on bad teams assembled by Ernie Grunfeld (quite possibly the worst active GM – that would actually be something worth examining) could mean he will leave for another team as soon as his rookie contract expires. I really am confused as to why these obvious flaws in apm don’t make people realize that it’s not useful. What is it telling. Bad correlation, insignificant for players switching teams, takes 5 years to tell you something, and even then, not much… Yet people will attack wins produced. I am no basketball fanatic. But I do recognize self-important trolls, in this case Jacob Grey Berger, who apparently is a non-entity in the statistical and basketball worlds. I implore you to invoke the Wages of Wins “No-Troll” policy. By the way, as someone who enjoys basketball in a layman’s way, reading your blog for the last few months makes watching the sports evening news in DC more understandable. I’ll offer a simple suggestion. Write a guest post about APM. I would be willing to bet if it is enlightening and clears things up then Dave would post it. Let me say I am wary on any model that says step one TONS of math. Step two look at number step three do a bunch of analysis on the number otherwise you’ll read it wrong. By the way there is something laughable about your attacks on Arturo and Dave for using the numbers from Basketball-Value. Really? Anyway looking forward to your guest post. Doesn’t the same question apply to you? I didn’t read through all the comments, but I have to raise an objection to using multiple years of data to try to correct for issues with only 1 year of adj +/- data. There are way too many players that are either in an upswing or downswing in their development from year to year due to age, experience, injuries, personal problems etc.. and even though players without those issues tend to be fairly consistent from year to year, not all are. for all your criticism for apm, i think it would be fair for you to respond to this post by phil birnbaum in his blog about wages of wins. I read through the post you cited in depth. I don’t see how any of the points in the post hold any water whatsoever. In other words, I don’t see that any responses are warranted. There’s nothing at all new here. The first baseman analogy is absolutely horrible, and it should be painfully obvious. In baseball, positions are fixed. In basketball, it’s true that small guys tend to play on the perimeter, and big guys tend to play down low, but the positions are not fixed. You do get big men who shoot 3’s, and you get perimeter players who post up. The analogy is fundamentally broken, and hence, so is the conclusion that some players “happen” to be in a better position than others. Big men aren’t “assigned” to the pain in the same way that a first basemen is “assigned” to first base. To suggest that is the case is laughable, and I would sincerely ask the person asking the question if he has ever seen or played a game of basketball. It betrays a fundamental misunderstanding of what positions are and how they function in the game of basketball. In basketball, any player at any given moment in time can go anywhere he wants on the court. Some players choose to position themselves to get rebounds. Some position themselves not to. To suggest otherwise is literally unbelievable. Doesn’t the position adjustment in WP48 account for the position played in such a way that to make some other adjustment to account for the, say, superiority of centers over guards in rebounding, redundant and therefore misleading? Ray Allen’s APM last year, as calculated by Basketball Reference, was among the very best in the league. This year, it’s abysmal. Yet he has largely the same teammates, play style and WP48 as last year, and his team has about the same record. Assuming that usually a player’s real performance doesn’t change too much year to year, could one get a measure of the noisiness of APM by comparing year over year APMs for each player? As a Raptors fan, I have to bring this up. 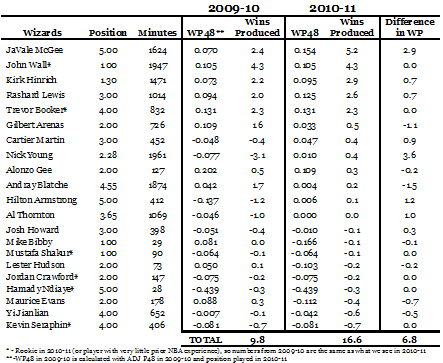 Andrea Bargnani Wins Produced and WP/48 = amongst the worst in the league. WHAT, pray tell, ARE the Raptors using to evaluate players? Seriously….I wanna know. Berri if you have some insight into this, please let me know. Bargnani is a number one pick who scores. What other stats do you need to consider? Statement: Nothing. The Raptors have no idea when it comes to stats. As Dave says, they picked him at #1, and he scores a lot of points (because he takes a lot of shots). Jay Triano, the Raptors’ coach, thinks that the Raptors are “7th or 8th” in the league at shooting (I have a post up about that). The whole organization just has no idea. Devin, I saw your post. There’s a nice little post by Liston on Raptors Republic if you wanna check it out. I understand that draft position and ppg influences pay, playing time etc…but the Raptors have had almost 5 years to evaluate this guy. Enough is enough. Bargnani is not just a #1 pick who scores, he’s Colangelo’s #1 pick who scores. GMs tend to prefer players that they draft/trade for. Letting them go makes them look bad. I would have thought that Colangelo has done enough to make himself look bad, though apparently that’s not the case. brgulker, players can go anywhere on the court but they usually play within a system with designated roles. Big men are supposed to rebound the ball and guards are put in positions where they are less likely to rebound the ball. Running systems usually have a guard waiting for an outlet pass as soon as the opposition launches a shot.To minimize transition baskets, older/slower teams might have a guard that runs back once a shot is taken. Those players might be bad rebounders but it would be misleading to make that assessment of their stats. @ Madz there is a reason for the guards to run back, because they’re small and out a of good position to get a rebound, they might as well go back on defence. Why don’t the centers run back on defence after a shot? They’re 12 inches taller than the guards and in a better position. Correlation vs. Causation is a concept that most 5th graders can grasp. Just because a rebound has been found to have a high correlation to individual contribution to team wins does not necessarily mean that its the actual act of rebounding that causes the individuals contribution to team wins. Berri has simply proven the correlation. Its called a correlation coefficient and not a causation coefficient for a reason. Once a correlation has been found it is up to smart people to figure out the cause as best as they can. It is probably then counterproductive to dismiss the correlation because the assumed relationship to cause doesn’t make sense. However, please continue to use other methods of talent evaluation based on causation coefficients. Those of us who depend on someone else to be other side of our bets depend on causation experts to eek out a living. Szr is right Wall has been trying to do more out of frustration, which seems to have lowered his production. Note number 2 is I love Trevor Booker. He plays so hard and I think he can be a pretty solid Haslem type player. Note 3, What does Ernie Grunfeld have to do to get fired? He’s been GM for a long time and his best results were a bunch of overpaid players producing ~.500 win percentage. Then he gets rid of all those guys and the team plummets to 15-25 wins a season. So he gets rid of the good players (Miller, Jamison, Haywood) then offers extensions to their backups who aren’t as good (Blatche, McGee, Likely to be Young this summer). When you do a rebuild in professional sports it seems to me that the most important move you can do is to fire the previous decision maker. First because obviously their decision making has already been proven poor. But MORE IMPORTANTLY this person will be biased in the future towards poor decisions they already made! This is why the Wizards are giving terrible contracts to terrible players! This is so frustrating. A volume shooter hitting 43% of his shots, not rebounding at all, not assisting, not stealing, not turning the ball over, not getting and 1s, not hitting 3s, would be looked at pretty poorly in this WP48 system. But his team would still be expected to score about 107 points per game if his team got him all the non tip in shots. 43*2+57*.3(2*.3+.43*.7*2). That would be good enough for a top 10 offense. I don’t see how a system that says 107 points per game is bad is a valuable system. What is that equation? Is that assuming 100 first shots per side per game? What is the second part? James, can you clarify your calculations? Some approximations, and keep in mind that they fluctuate from year to year: the average NBA team uses about 95 possessions/game. 15% of those end with a turnover, 30% with an offensive rebound. We’ll assume these numbers are the same for this hypothetical. With 95 possessions and a 15% turnover rate, that’s 80 shots (95 – (95 x .15)). If a team (or player) shoots nothing but 2s and shoots 43%, his team will score 69 points (80 x 2 x .43). However, there’ll be plenty of chances for offensive rebounds. NBA teams rebound 30% of their own misses, so the team is looking at another 14 chances. (.3 x (80 – (80 x .43))). So factoring in turnovers, that’s another 12 shots (14 – (14 x .15)), another 10 points (12 x .43 x .2), another 2 offensive rebounds, and another 2 points. So that’s 81 points per game, or just over .85 points per possession, or an offensive efficiency of 85. Not 107. The average NBA team has an offensive efficiency of 103, or 1.03 points per possession, and scores 98 (95 x 1.03) points per game. 1. 107 is a preposterous number. Only Denver scores that much, and they combine a blistering pace and great offensive efficiency. 3. The most efficiency place to score is with FTs or 3s. On average, teams shoot 75% on FTs and every team in the league is above 69%. Teams also shoot 37% from 3 (and this has been trending up), and virtually every team in the league shoots better than 33%. The average NBA team shoots about 45% on twos. But there’s not a single team shooting over 48%. 4. In a vacuum, 43% shooting really, really hurts a team. Another word for “causation expert” is “good coach”. I can’t decipher James’ math (and I’m too lazy to figure it out), but I think he’s saying that if a team got the usual number of tip in shots from various players on some possessions and when they didn’t get a tip in gave it to a 43% shooter, they would score 107 points. I don’t think I buy that for various reasons. @ robbieomalley — I’m not an Ernie Grunfield fan, and I’d love to see him leave the Wizards. That said, I think your narrative is wildly over-simplified. I’m pretty sure the goal when he arrived — marching orders from his boss — was to produce a “competitive” product while keeping costs in the middle of the NBA pack. He did that — and he did it pretty quickly. And I remember him repeatedly using the word “competitive” and the phrase “we can compete w/ anyone when we’re healthy”. The implosion of that team was certainly caused by factors not in Ernie’s control, above all Arenas’s major injury and seemingly undisciplined ways of managing his recovery. As to the trade of a 5th pick for an excellent (but rent-a-)player (Mike Miller) and a non-entity (Foye), doesn’t that seem as well to have been done at Abe Pollin’s direction? To try to produce results right away, given his age and poor health? If we look at Grunfield’s work this past off-season, other than the forehead-furrowing decision to sign Josh Howard, he seems to have done well. John Wall has been quite productive for a rookie (just as productive as the highly touted here Evan Turner and more productive than the next few picks). And the decision to trade up from #30 to #23 to get Trevor Booker *must* look good to you, no? Trading nothing for Kirk Hinrich (and $$ to pay his salary!) plus the #17 pick — surely that too was a good move? Kevin Seraphin, taken w/ the pick, is raw, and I would have taken Damion James — but we don’t know whether either guy will be productive to tell the truth, and from there down to Landry Fields at #35 I can’t think of a productive rookie (other than James and Booker). The trade for Yi cost nothing and accomplished nothing. In all, this was some pretty good work — add the fact that he was able to trade Hinrich for a round 1 pick and a rookie (whose college productivity was above average), I think he did pretty well — if you don’t, I’d be happy to hear why. As to the decision to extend Andray Blatche, that was a bonehead decision. Incomprehensible and a step backwards. All the same, hasn’t he done a little better than you are allowing? He has yet to acquire a .2+ player. He could have gotten Kevin Love for that pick but instead traded for Miller(fine) and Foye(wtf!!!!). All in all the Wizards currently have three players producing at an above average rate for their age. They have one player who plays as well as the average NBA starter. Grunfeld has been around for years. These are terrible results any way you look at it. Anyone who frequents this blog could have done a better job while only putting in 2 hours a week including 1 hour and 55 minutes a week of staff happy hour. Me either. Most teams get around 2 pts/game, according to 82games.com. It’s boggling. @ marparker — wasn’t Jamison a .2+ player at least one year w/ the Wizards? Oh, I can’t blame you if you “hate” Grunfield (using the term the way we do online: I’m sure you wouldn’t be mean or even impolite in his presence). He doesn’t have a very good record. Still, don’t you agree he did a good job last off-season? Perhaps, like some people here, you think he should have taken DeMarcus Cousins w/ the first pick in the draft? (How would that have worked out, Dave?) Or Evan Turner (he was regarded here as *obviously* *much* better than Wall — has it turned out that way?). And the pick of Trevor Booker is certainly looking like a steal — Grunfield traded up to get him. Had he kept the #30 pick he might have gotten Dexter Pittman instead. If I were Ted Leonsis, I’d replace Ernie — but if you really think that what goes on in the comments on this blog has *anything* to do with being a GM, well… I’ll just assume it was a quip and leave it at that.